The 2018 United States House of Representatives elections in Michigan was held on November 6, 2018, to elect the 14 U.S. Representatives from the state of Michigan, one from each of the state's 14 congressional districts. The elections coincided with the gubernatorial election, as well as other elections to the House of Representatives, elections to the United States Senate in 33 other states and various state and local elections. The filing deadline for candidates filing for the August 7 primary was April 24, 2018. Unless otherwise indicated, the Cook Political Report has rated the congressional races as safe for the party of the incumbent. Two seats shifted from Republican to Democratic control. In the 8th Congressional District, Elissa Slotkin defeated incumbent Mike Bishop and in an open seat for the 11th Congressional District, Haley Stevens defeated Lena Epstein. This leaves Michigan's U.S. House delegation in the 116th United States Congress with seven Democrats and seven Republicans. Matt Morgan was the only Democrat to file to run. However, Morgan was removed from the ballot because he used a PO box address on his nomination petitions instead of his residential address. Instead, Morgan ran a write-in campaign, hoping to qualify for the ballot by winning at least five percent of the total votes cast in the district for the Democratic gubernatorial primary. Over 4,800 votes were cast in Marquette County, which would have been enough by itself to qualify Morgan for the ballot. According to official results, Democrats cast 29,293 write-in votes in the primary for Morgan, more than seven times the 3,781-vote threshold. On August 24, the Board of State Canvassers placed Morgan on the November ballot. The 2nd district is located in West Michigan and is anchored by the suburbs of Grand Rapids such as Kentwood and Wyoming, other cities include Holland and Muskegon. This district has a PVI of R+9. The incumbent is Republican Bill Huizenga, who has represented the district since 2011. He was re-elected to a fourth term with 63% of the vote in 2016. The 3rd district is located in inland West Michigan, centered on the city of Grand Rapids, and extends down to Battle Creek and Marshall. This district has a PVI of R+6. The incumbent is Republican Justin Amash, who has represented the district since 2011. He was re-elected to a fourth term with 59% of the vote in 2016. The 4th district is located in Northern and Central Michigan including portions of the Tri-Cities region, specifically Midland, other cites include Mount Pleasant and the northern suburbs of Lansing. This district has a PVI of R+10. The incumbent is Republican John Moolenaar, who has represented the district since 2015. He was re-elected to a second term with 62% of the vote in 2016. The 5th district is located along the eastern coast of Michigan, centered on the Tri-Cities region of Mid Michigan, such as Bay City and Saginaw, and stretches down into Flint. This district has a PVI of D+5. The incumbent is Democrat Dan Kildee, who has represented the district since 2013. He was re-elected to a third term with 61% of the vote in 2016. Kildee considered running for governor in 2018, but decided to run for re-election instead. Michigan's 5th district has been included on the initial list of Democratic held seats being targeted by the National Republican Congressional Committee in 2018. There is one Republican candidate, Durand resident Travis Wines who lives outside the district. Michigan's 7th district has been included on the initial list of Republican held seats being targeted by the Democratic Congressional Campaign Committee in 2018. The 8th district is centered on the state capital, Lansing, and stretches into the northern outskirts of Metro Detroit including Rochester Hills. This district has a PVI of R+4. The incumbent is Republican Mike Bishop, who has represented the district since 2015. He was re-elected to a second term with 56% of the vote in 2016. This race is considered to be competitive. The Cook Political Report rated this contest as 'Tossup'. Michigan's 8th district has been included on the initial list of Republican held seats being targeted by the Democratic Congressional Campaign Committee in 2018. The 9th district is located in Metro Detroit including Roseville, Royal Oak, and Warren. This district has a PVI of D+4. The incumbent is Democrat Sander Levin, who has represented the district since 2013 and previously represented the 12th district from 1993 to 2013 and the 17th district from 1983 to 1993. He was re-elected to an eighteenth term with 58% of the vote in 2016. In December 2017, Levin announced his retirement, and that he would not seek re-election in 2018. Michigan's 9th district has been included on the initial list of Democratic held seats being targeted by the National Republican Congressional Committee in 2018. The 10th district is located in an area of the Lower Peninsula of Michigan known as The Thumb and parts of the Metro Detroit area including Chesterfield, Macomb, and Port Huron. This is the most Republican friendly district with a PVI of R+13. The incumbent is Republican Paul Mitchell, who has represented the district since 2017. He was elected to replace retiring Representative Candice Miller with 63% of the vote in 2016. Michigan's 11th district has been included on the initial list of Republican held seats being targeted by the Democratic Congressional Campaign Committee in 2018. Marty Knollenberg, state senator running for re-election. The 12th district is based in Ann Arbor and the surrounding cities including Ypsilanti, and the western suburbs of Detroit including Dearborn and Lincoln Park. This district has a PVI of D+14. The incumbent is Democrat Debbie Dingell, who has represented the district since 2015. She was re-elected with 64% of the vote in 2016. The 13th district is centered on the city of the Detroit and the immediate surrounding suburbs including Dearborn Heights, Garden City, and Westland. This is the most Democratic-friendly district with a PVI of D+32. The seat was vacant for most of 2018, following the resignation of John Conyers in December 2017. A special primary and special general election were held in August and November 2018, on dates coinciding with the already scheduled primary and general elections in a money-saving move by Michigan Governor Rick Snyder. Conyers represented the district from 2013 to 2017. He previously represented the 14th district from 1993 to 2013, and the 1st district from 1965 to 1993. He was Dean of the United States House of Representatives, and was re-elected to a twenty-seventh term with 77% of the vote in 2016. Former state representative Rashida Tlaib won the Democratic primary. Tlaib, however, lost the special primary to Brenda Jones, president of the Detroit City Council. Jones served for just over eight weeks before Tlaib was sworn in. David Dudenhoefer was the only Republican candidate to announce his run for the Republican nomination, but he failed to qualify. He did, however, run as a write-in candidate. As a result, Tlaib was opposed in the general election only by minor party candidates and write-in candidates. The 14th district stretches from the northern Detroit suburbs including Farmington Hills, Southfield, and West Bloomfield, to eastern part of Detroit. This district has a PVI of D+30. The incumbent is Democrat Brenda Lawrence, who has represented the district since 2015. She was re-elected to a second term with 79% of the vote in 2016. ^ "Michigan Dems flip two Republican seats in U.S. House". Detroit News. ^ "2018 Michigan Election Results". Lansing, U.S.A.: Department of State, Michigan. Retrieved November 19, 2018. ^ a b c d e f "2018 House Race ratings - The Cook Political Report". The Cook Political Report. Retrieved August 29, 2018. ^ "Only Democrat in Michigan race will have to run as write-in candidate". Retrieved August 29, 2018. ^ jtravis@record-eagle.com, JORDAN TRAVIS. "Matt Morgan declares write-in campaign a success". Retrieved August 29, 2018. ^ "Democrat Matt Morgan will be on ballot in 1st Congressional District". Retrieved August 29, 2018. ^ a b c d e f g h i "2018 Michigan Official Primary Candidate Listing - 08/07/2018". miboecfr.nictusa.com. Retrieved August 29, 2018. ^ Irizarry, Jaleesa (June 4, 2017). "After health care debate, ER doctor runs against US Rep. Bill Huizenga". WZZM. Retrieved June 5, 2017. ^ a b c d e f g h "Who's running for Congress in Michigan". Retrieved August 29, 2018. ^ Gray, Kathleen (May 8, 2017). "U.S. Rep. Dan Kildee will forgo race for governor". Detroit Free Press. Retrieved May 10, 2017. ^ a b Nann Burke, Melissa (May 27, 2017). "Upton generates buzz, backlash for role in health bill". The Detroit News. Retrieved June 2, 2017. ^ Barrett, Malachi (July 20, 2017). "Democrat focuses on economy in 2018 challenge to Fred Upton". Kalamazoo Gazette. Retrieved July 21, 2017. ^ a b "Former Kellogg Exec Might Seek Upton's Seat". WSJM. March 21, 2017. Retrieved March 23, 2017. ^ Devereaux, Brad (October 5, 2017). "Former Kellogg lobbyist George Franklin announces congressional run". Kalamazoo Gazette. Retrieved October 5, 2017. ^ Barrett, Malachi (July 18, 2017). "Democrat doctor challenges Fred Upton in 2018 after health care vote". Kalamazoo Gazette. Retrieved July 18, 2017. ^ Barrett, Malachi (July 6, 2017). "Paul Clements announces third challenge to Fred Upton in 2018". Kalamazoo Gazette. Retrieved July 6, 2017. ^ McNeill, John (March 7, 2017). "Kalamazoo's population grows famously". WNWN-FM. Retrieved March 23, 2017. ^ a b c "George Franklin for Congress". georgefranklin.com. Retrieved August 29, 2018. ^ a b c Cheney, Kyle (January 30, 2017). "Amid Democratic doldrums, DCCC identifies 2018 targets". Politico. Retrieved March 23, 2017. ^ Oosting, Jonathan (July 19, 2017). "Driskell seeks rematch with Rep. Walberg". The Detroit News. Retrieved July 19, 2017. ^ "Challenger Elissa Slotkin outraises Rep. Mike Bishop over three months". Retrieved August 29, 2018. ^ Spangler, Todd (July 10, 2017). "Ex-Pentagon, intelligence official Elissa Slotkin to challenge Mike Bishop for Congress". Detroit Free Press. Retrieved July 10, 2017. ^ "Races for new Circuit Court seat, state House and Senate set as filing deadline passes". Retrieved August 29, 2018. ^ Peterson, Kristina (December 2, 2017). "Rep. Sander Levin of Michigan to Retire". The Wall Street Journal. New York. Retrieved December 2, 2017. ^ "Levin, Bieda running for Congress". Retrieved August 29, 2018. ^ Oosting, Jonathan. "Oakland County Treasurer Andy Meisner says he WON'T run for Congress in #MI9". Twitter. ^ "Steve Bieda drops out of U.S. House race to run for Spranger's office". Retrieved August 29, 2018. ^ "EMILY's List Endorses Ellen Lipton in Michigan's 9th District". www.emilyslist.org. Retrieved August 29, 2018. ^ a b Schneider, Elena (September 11, 2017). "Michigan Rep. Dave Trott won't run for reelection". Politico. Retrieved September 11, 2017. ^ Roskopp, Jack. "Republican Michigan Representative Dave Trott not seeking reelection". Retrieved August 29, 2018. ^ Todd Spangler (October 17, 2017). "State Rep. Tim Greimel joins crowded congressional field". Detroit Free Press. Retrieved October 19, 2017. ^ Burke, Melissa (January 5, 2018). "Democrat Gupta raises $501K in bid to replace Trott". The Detroit News. Retrieved March 22, 2018. ^ Nann Burke, Melissa (July 13, 2017). "Former Duggan official plans run against Rep. Trott". The Detroit News. Retrieved July 13, 2017. ^ Oosting, Jonathan (April 27, 2017). "Michigan native comes home for run against Rep. Trott". The Detroit News. Retrieved April 27, 2017. ^ a b "Board: 7 U.S. House hopefuls tossed from primary ballot". Retrieved August 29, 2018. ^ Gorchow, Zach (September 11, 2017). "On the Barb McQuade/#MI11 rumor, she says when I asked if she's looking at it, "No, not at all. I don't even live in the 11th District."". Twitter. Retrieved September 14, 2017. ^ Jacobs, Ben (September 12, 2017). "Former congressman Kerry Bentivolio tells me he is "seriously considering" running for his old seat which is being vacated by Dave Trott". Twitter. Retrieved September 14, 2017. ^ Oosting, Jonathan (October 16, 2017). "Bentivolio eyes return to Congress". Detroit News. Retrieved October 16, 2017. ^ a b "Raczkowski, Epstein enter race to succeed Trott". Retrieved August 29, 2018. ^ Spangler, Todd (September 11, 2017). "U.S Rep. Dave Trott to leave Congress". Detroit Free Press. Retrieved September 11, 2017. ^ a b Nann Burke, Melissa (September 11, 2017). "Rep. Dave Trott is retiring from U.S. House". The Detroit News. Retrieved September 11, 2017. ^ "Former candidate Kristine Bonds endorses Mike Kowall for Congress". Mike Kowall for Congress. July 16, 2018. ^ Kadrich, Brad (September 12, 2017). "Heise eyes run for Trott's House seat". Plymouth Observer. Retrieved September 14, 2017. ^ Spangler, Todd (February 22, 2018). "Patterson endorses state Sen. Mike Kowall for Trott's seat in Congress". Detroit Free Press. ^ a b Lena Epstein. "Thank you to @RepDaveTrott for endorsing my campaign to represent #MI11. Congressman Trott has been a strong, conservative representative for our district throughout his time in Washington, and I look forward to bringing the same passion and conservative ideals to Congress". Twitter. ^ "Detroit Free Press Endorses Mike Kowall in MI-11 Republican Primary". Mike Kowall for Congress. July 27, 2018. ^ Lena Epstein. "Thank you @realDonaldTrump for supporting our campaign to represent #MI11!". Twitter. ^ Mike Pence. "Great to be in Michigan tonight! Proud to support @LenaEpstein - an early supporter of President Trump. She'll be a fighter for the @RealDonaldTrump agenda in Congress & a strong advocate for the people of Michigan! #MI11". Twitter. ^ "SBA List Endorses Lena Epstein in MI-11". Susan B. Anthony List. April 13, 2018. ^ "Maggie's List endorsement". Lena Epstein for Congress. ^ "Lena Epstein". VIEW PAC. ^ "For Congress, from Metro Detroit". The Detroit News. July 12, 2018. ^ Gray, Kathleen; Spangler, Todd (December 5, 2017). "John Conyers retires after 53 years in office amid sexual harassment claims". Detroit Free Press. Retrieved December 5, 2017. ^ "Snyder sets Aug. 7, Nov. 6 election dates to replace John Conyers in Congress". Retrieved August 29, 2018. ^ Bever, Lindsey (December 5, 2017). "John Conyers could be replaced by his son — who has his dad's name but not his political resume". The Washington Post. Retrieved December 6, 2017. ^ Oosting, Jonathan (December 7, 2017). "Conyers III denies allegations, unsure on Congress run". The Detroit News. Retrieved December 8, 2017. ^ Burke, Melissa Nann (5 February 2018). "State lawmakers running for open seats in Congress". The Detroit News. Retrieved 14 March 2018. ^ Hicks, Mark (January 26, 2018). "Detroit City Council head seeks Conyers' Congress seat". The Detroit News. Retrieved January 29, 2018. ^ Spangler, Todd (February 6, 2018). "Former Michigan state Rep. Rashida Tlaib to seek Conyers' seat in Congress". Detroit Free Press. ^ "Westland Mayor Bill Wild to run for John Conyers' vacated U.S. House seat". ^ Oosting, Jonathan (December 8, 2017). "Coleman Young II running for Congress". The Detroit News. Retrieved December 8, 2017. ^ Williams, Corey; Eggert, David (December 8, 2017). "Son of late Detroit Mayor Coleman Young to run for John Conyers' seat". The Press Democrat. Retrieved December 8, 2017. ^ Bartkowiak Jr., Dave (5 December 2017). "How Rep. John Conyers' House seat will be filled". Click On Detroit. Retrieved 16 December 2017. ^ Burke, Melissa Nann (5 February 2018). "Another state lawmaker running for Conyers' seat". The Detroit News. Retrieved 14 March 2018. ^ "Kimberly Hill Knott for Congress". www.facebook.com. Retrieved August 29, 2018. 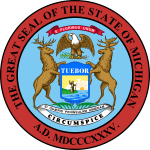 ^ "2018 Michigan Official Primary Candidate Listing". Retrieved 9 July 2018.